Celebrity producer Na Young-seok’s new-concept reality show “Three Meals a Day” was a sensational hit when it aired last year. Based on a simple premise of making your own meal from scratch, two urban men, who happen to be an A-list TV actor and a K-pop idol, struggled with rural life in the middle of nowhere. Following on the huge success of its inaugural season and a spin-off, the show returns Friday with the original cast ― actor Lee Seo-jin and singer Ok Taec-yeon ― joined by a third member, actor Kim Gwang-gyu. And this time around, they face a more daunting task: They have to farm. They will be growing and harvesting crops from spring to early fall, in addition to cooking three meals a day. Grocery shopping is strictly prohibited. Their livestock holdings will be larger, with Jackson the goat and her two babies and cute little Minky the dog, now all grown up. “We will plant corn in the 3,305-square-meter field. Even local farmers warned us it won’t be easy, but we will add more crops to that,” producer Na said at the press conference in Seoul on Wednesday. Lee is crazy about growing potatoes, while Ok wants to grow lemons so he can drink soju mixed with lemon juice, he added. 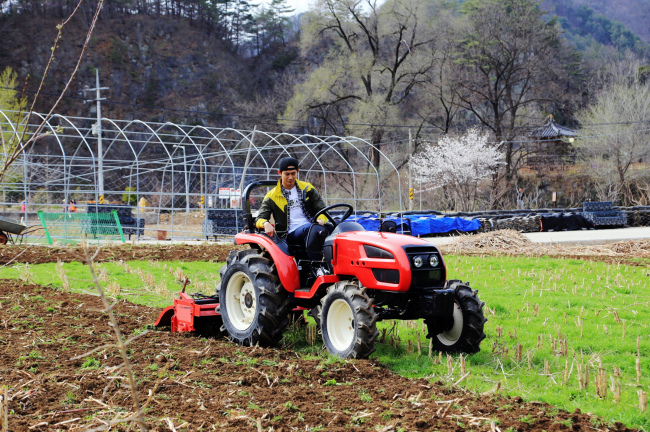 Every week, guests will be visiting the three single men in their small farmhouse in Jeongseon. He also mentioned that viewers may see actress Choi Ji-woo invited as a guest again for the second season. Choi was one of the guests for the first season and on the cast of Na’s other travel reality show “Grandpa over Flowers” recently. “This time, we’re hoping that Choi brings her friends along,” Na said, indicating her close actress friends Kim Tae-hee and Song Hye-kyo. The filming for the second season is taking place every two or three weeks from April. A small farming house and the vast farm field are closely filmed by a set of 40 cameras for 24 hours. “The second season has everything that I love. Nature, animals and the slow life. How humans and animals adjust to live together in nature,” said Na. The first episode of the second season of “Three Meals a Day” airs at 9:45 p.m. Friday on tvN.